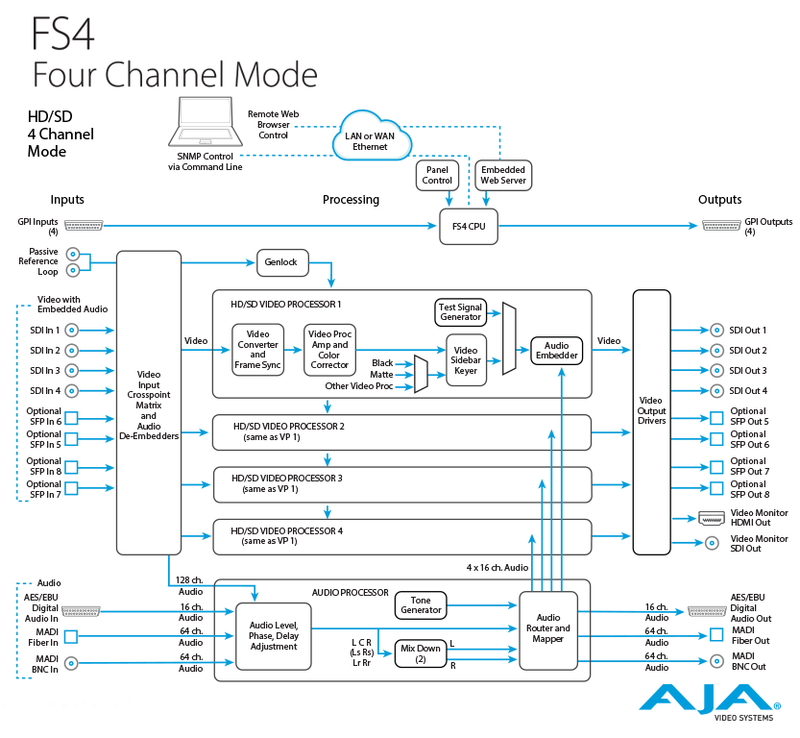 FS4 offers two modes for comprehensive conversion and signal processing. Four channel mode offers 4x 2K/ HD/SD channels of simultaneous conversion and processing, all within an elegant 1RU chassis for multi-channel high density delivery. 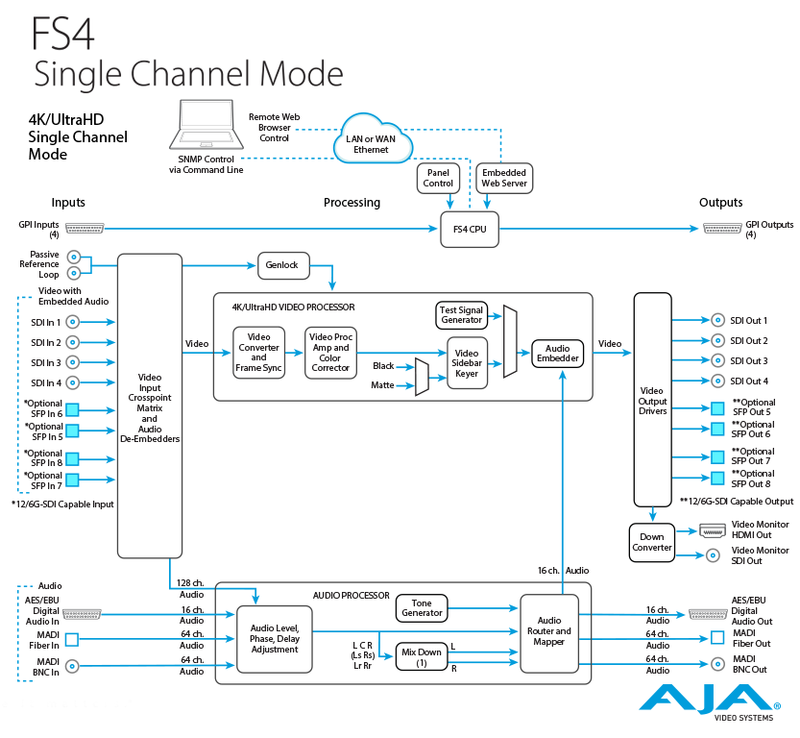 FS4 is your real world answer for conversions of to and from multiple resolutions, built to AJA’s high quality and reliability standards. 4K/UltraHD delivery, processing and synchronization is fast becoming the next standard, and FS4 gets you there with a wealth of digital video connectivity including Quad 1.5G, Dual 3G, Quad 3G over 3G-SDI and 12G/6G over optional 12G-SDI BNC and 12G-SDI LC Fiber SFP modules. In single channel mode, FS4 will upscale your HD or SD materials to 4K/UltraHD and back, with a huge array of audio channels over Fiber, 3G-SDI, AES, and MADI for an incredible 272 x 208 matrix of audio possibilities. In four channel mode, FS4 provides incredibly powerful multi-channel conversion with up to four channels of simultaneous processing for 2K/HD and SD signals. New thinking requires a new layout, and FS4’s front panel has been redesigned to simplify and speed your access to the product’s wealth of features. The panel has also been designed to provide straightforward operation in single channel or four channel mode. In four channel mode, all four VIDx buttons under Channel Select are lit up. In single channel mode, only VID1 is lit and VID2-4 are off. Multi-channel density in a 1RU chassis - space, energy and power preserved. Utilizing AJA's remarkable conversion algorithms, FS4 supports realtime up, down, cross-conversion from SD, HD or 2K over 12G/6G/3G-SDI video to 4K or UltraHD video and back. Both Quadrant (Square Division) and 2SI (Two Sample Interleave) output formats are supported. FS4's SFP options include both 12G/6G-SDI HD-BNC and Fiber I/O options including single and dual channel Single Mode options and Multi-Mode options, allowing great SDI flexibility and fiber cable runs of up to 10 kilometers to be connected directly to the FS4 without the need for separate fiber to SDI conversion. FS4 supports closed captioning and the conversion of closed captioning between 2K/HD/SD and 4K/UltraHD formats - including full conversion of CEA-608 and CEA-708 standards. FS4 can preserve closed captioning even when converting between formats, removing the need to reinsert closed captions after conversion.